Vesta used to be round—until it got hit by something nearly one-tenth its size. The resulting impact basin, named Rheasilvia, fills most of this image, taken from some 5,200 kilometers away. Vesta’s south pole lies in the mountains at lower right, while the parallel grooves at left (also created by the impact) run roughly along the equator. Out between Mars and Jupiter lies a rubble of planets that never quite formed. Although the asteroids date to the birth of our solar system, our closest looks at them have been glimpses from spacecraft whizzing by en route to the glamorous outer solar system. That changed last July, when NASA's Dawn probe slipped into orbit around Vesta, the asteroid belt’s second most massive member. Dawn, managed by Caltech’s Jet Propulsion Laboratory (JPL) with UCLA’s Christopher Russell as principal investigator, has now mapped about 80 percent of Vesta in 3D. In May, a set of six papers describing the Dawn team’s initial findings were published in the journal Science. If Vesta had gotten that hot, the scientists reasoned, its heavy elements would have melted and sunk to the core in a process called differentiation — a key step on the road to planethood. In fact, joked JPL’s Carol Raymond, Dawn’s deputy principal investigator, "We like to call Vesta 'the smallest terrestrial planet.'" Raymond’s gravity data put its core at about 18 percent of Vesta’s total mass, or proportionally about two-thirds as massive as Earth’s core. Dawn’s mapping spectrometer has verified an even wilder conjecture from the 1970 paper: Vesta is indeed the source of the howardite-eucrite-diogenite (HED) meteorites found on Earth and Mars. Cross sections of a eucrite meteorite found in Antarctica (at left); a diogenite (at right), also from Antarctica; and a howardite (center) from North Carolina. The eucrite’s very fine crystals formed during the rapid cooling of Vesta’s upper crust; the diogenite’s crystals had time to grow bigger while Vesta’s inner crust slowly solidified. Howardite is a mishmash of eucrite and diogenite shards, born in the impact that blew them sky-high. The Dawn team thinks the HEDs came from an impact basin the team has named Rheasilvia, after an ancient Roman vestal virgin priestess. Counting the craters within Rheasilvia gives it an age of about 1 billion years, surprisingly recent for something so big. At 310 miles (500 kilometers) in diameter, Rheasilvia is nearly as large as Vesta itself, and is the result of a collision that stripped away most of the crust from the southern hemisphere, baring Vesta’s interior like a clumsily peeled orange. 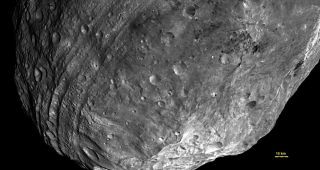 “Vesta likely came close to shattering,” said Raymond, noting that the blow left concentric sets of troughs — fracture lines — around Vesta’s equator. Rheasilvia doesn’t represent Vesta’s only near-death experience. Dawn found a second basin, nearly as big and a billion years older, sticking out from under Rheasilvia. This basin, named Veneneia (for another vestal virgin), is also a potential source of HED meteorites. This article was provided by the California Institute of Technology's quarterly magazine "Engineering & Science."